I didn't get a chance to comment on the resigning of Alex Semin last week due to time constraints. As I look at his one year, $6.75 million contract, I don't see a long term commitment to Semin for the Capitals. What I do see is a more attractive trade option for other teams to consider. Probably the biggest problem with trading for a player whose contract ends by the summertime is losing not only what you traded for the player, but the asset you acquired as well. Especially when that player becomes a unrestricted free agent who will test the market. If George McPhee does want to move the Russian with golden hands, signing a one year contract gives the potential tradee some comfort in knowing they have Semin for at least a year. This is not to say McPhee is even considering trading Semin. Let's be honest, he might need whatever offense Semin can muster come playoff time. But it gives him the option to entertain the deal to teams that might be interested in wooing Semin away. It is kind of like a guarantee to play for one year with whichever team needs him most (or willing to pay the most for him). If McPhee wants to trade him before the deadline, Semin now looks more attractive to potential teams looking for a trade. If he wants to hold onto his forward, he is still an attractive prospect in the off season. McPhee also doesn't take a multi-year hit on an expensive contract if no trade can be harvested. In many ways, it's a good signing for the Capitals, until his year runs out and a new contract has to be hammered out. McPhee isn't necessarily nailed to the floor when it comes to a streaky player in Semin. Alex Ovechkin and Mike Green certainly did not stand out in this All Star game, but they didn't necessarily played badly either. Ovi had a fluke goal just :50 seconds into the game when a pass deflected off Duncan Keith's stick and trickled past Marc-Andre Fleury. He would add an assist in the second period but would leave the game with a -2. Ovechkin also had the game's only penalty when he turned the puck over at the offensive blue line. Matt Duchene would end up with a break away and Ovi slid his stick in an attempt to disrupt the Colorado forward. The stick would end up just sliding by and Duchene and Henrik Lundqvist made the save on the original break away and the subsequent penalty shot. No harm, no foul. Ovechkin makes history again as it was the first ever penalty shot awarded at an NHL All Star game. Green would have two assists, both in the first period. He played well with his defensive partner Zdeno Chara who also had a pair of assists. It was tough for Green to jump in the play when Chara did his fair share of getting into the offensive breaks. There were times when both Green and Ovechkin were on the same shift and the pair at times played a great give and go. It didn't end up on any goals besides the first fluke by Ovi. The game stayed true to the All Star mantra. Lackluster play with plenty of offense and a defense that plays like they could care less about actually playing the position. Patrick Sharp would take home the MVP honors as he had a goal and two assists all in the first period. The MVP voting happened through the first period because fans really missed out on a few others who were worthy of the MVP like Nick Lidstrom who finished with a +7, or Shea Weber who had four helpers and a +6, or Loui Eriksson who had 2 goals and assists for 4 points on the night. The entire weekend was a pretty fun experiment as the NHL is trying to make this game more fun for both fans and players. Here are a few of my pluses and minuses. PLUS - The Player draft. As weird and awkward as it was, the draft was a unique twist on the game itself. It is only the first time it has happened, and I am sure it can only improve from here on out if the league sticks with it. minus - The whole guardian project thing. It was lame, as I feared it would be. PLUS - The entrance players got for the Super Skills competition. With a thin line of smoke over the entrance to the ice the players' name, number and team logo was lit up on the smoke as players skated through it. They then skated past a giant mural of themselves on huge sheets draped from the scoreboard while their highlights played out on the ice surface on either side. minus - The entrance at the actual game. Boring. PLUS - The Hurricane fans, they cheered for their team, Team Staal who had all three 'Cane All Stars. They also cheered for Chara's hardest shot, Ovi's shoot out dazzler and Grabner's speedy run in the fastest skater. They showed up garbed in their Hurricane jerseys and made the game somewhat fun to watch. minus - Sidney Crosby, who didn't even show up for any of the events at All Star weekend. Even though he did not play, it would have been nice to have him there to be a steward of the game. PLUS - The uniforms. I actually liked them, both for Team Stall and Team Lidstrom. Sometimes the league tries to do too much on the their sweaters, but I liked the simplicity of the sweaters. minus - The Globe taking a dump on anything different the league tries to do. It's the first time the NHL has done this, give them a break. At the very least they generated interest. PLUS - Eric Fehr (@EricFehr16) and Karl Alzner's (@karlalzner) tweets from Universal Orlando. While it was a fun weekend for the league's best, it's back to work for the Capitals. They have to find their offense again as they push for first in the Southeast Division. Alex Ovechkin had to answer a lot of questions about his lack of offensive production before his Hockey Night in Canada debut. His response was a three goal outburst, his first hattrick since October. His three goals and Braden Holtby's almost epic goaltending helped the Capitals defeat the Toronto Maple Leafs 4-1. This would be Ovechkin's second straight multi-point game (a goal and assist against the Islanders, three goals tonight). Matt Hendricks scored a beauty of a break away on Leafs' netminder J.S. Giguere. Holtby held the fort, especially on a series of great offensive pushes by the Maple Leafs. Ovechkin got things started on a harmless wrister by Jeff Schultz to the front of the net. Ovi drove the net from the corner getting between Giguere and the Leaf defender and got a stick on the passing shot. It tipped into the net and despite pleads of goaltender interference when Ovi bumped into Giguere the play stood. After the 1-0 lead, the Caps seemed to be content to play back and wait out their chances on Leaf mistakes. It lead to a period and half stalemate that would not be broken until Ovi struck again in the third period. Dion Phanuef blocked the initial shot but the puck trickled right to Ovechkin's stick. He beat the Leafs' goaltender five-hole to give the Caps the 2-0 lead. The Maple Leafs would not go quietly in the night. Instead, just 1:40 later, the Leafs would cut the lead in half with a deflected shot by Tim Brent. It looked like the Leafs had wrestled the momentum away from the Capitals and were pressing. Holtby took over from there, making a series of great saves. The Caps' defense also came to the rescue by blocking 27 shots for their goaltender. Even captain Ovechkin stepped in front of three shots himself. They bent, but never broke and Hendricks would give the Caps the insurance goal they needed. The Leafs actually won the face off deep in the Caps zone, but Hendy's hustle to get to the point lead to a turnover after the Leaf defenseman made a hasty decision to get the shot off. Hendricks blocked the shot and the puck bounced to center ice giving the rugged forward a break away. Hendy out-waited Giguere before he dekeed around him and slipped it into the net for the two goal insurance. He was an assist shy of the "Gordie Howe" hattrick of a goal, assist and a fight (first period bout with Mike Brown). Giguere was pulled for an extra attacker with 2 minutes still left in the game as the Leafs tried to get back into the game. Ovechkin would not be denied the hattrick and he out skated Tomas Kaberle to get to a loose puck and he put the game on ice. While the Ovechkin enjoyed the hattrick and Holtby gets his second win in a row, the Caps earn two points on the night to keep pressure on Tampa Bay atop of the Southeast Division. Holtby played a dazzling game, preserving the Caps' lead through out the game with some ten-bell saves to his merit. He would take away the game's first star as he turned aside 35 shots including all 18 shots in the third period. Special teams did not really play a factor in the game. The Caps were hit with three penalties, all in the first period. The Capitals' penalty kill did its job killing off all three Leaf power play chances. They only had two shots with the extra man and failed to convert on either power play. Nick Backstrom did not have a strong game. Even though he would have two assists (both on Ovi's first and empty net goals) he took two penalties early in the game. He was dismal in the face off circle only winning 23% of his draws (3-10). But since putting Jason Chimera on the top line, even an off night by Backstrom was a spectacular night for Ovechkin. It sort of evened itself out. The Caps pull into one point behind Tampa Bay, putting pressure for first in the Southeast Division. The outlook gets tougher for the Caps before the All Star break as they face the Rangers at home then travel to Atlanta to take on the Thrashers. Hopefully, the scoring slump has been lifted for the Caps. Mike Green was named an alternate captain on Team Staal for the NHL's 2011 All Star game. Vancouver's Ryan Kesler was also named alternate captain under Staal. While on Team Lidstrom, Martin St. Louis and Patrick Kane were named also named alternate captains. The ASG draft will be on January 28th, 8 ET on Versus (US). Michal Neuvirth, Matt Bradley, Tom Poti, Alex Semin and Eric Fehr are all out with injuries, no updates on their return. Neuvirth, Poti and Semin are listed day-to-day. Since being promoted to the top line, Chimera now has points in 4 straight games. He had a secondary assist on Ovechkin's second goal. The Capitals might be struggling with their offense, but they are showing they can finish a strong game with the score tight. They are also still able to put points on the standings and stay even with their divisional foes Tampa Bay. The Capitals would slip away from Long Island with a win over the New York Islanders 2-1. More important than just preserving a close lead, the Caps' big guys get some of their offensive juices flowing. Nick Backstrom would have the game's gwg and an assist as well. Alex Ovechkin would finish with a multi-point game netting two assists and Jason Chimera is fitting in on the top line with the game's first goal. John Carlson would also have a secondary assist on the game winner. Braden Holtby would turn away 24 shots to get the win. The Caps jump out to a rare early lead just 3:41 into the game when crashing the net pays off for the speedy Chimera. After a brilliant deke to free himself on the wing, Backstrom stormed the right side gaining the Islander zone and dropped the puck to Ovi. Ovechkin shot it to the crashing Chimera and it was just a simple tip in to give the Caps the 1-0 lead. The lead would extend to two goals around the same three minute mark in the second period. Another rush by Ovechkin took Rick DiPietro out of the play leaving the puck alone in the crease. 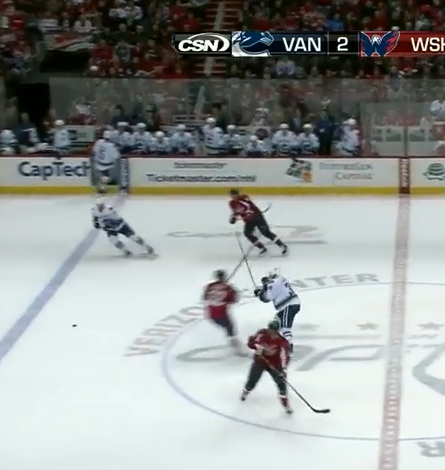 Backstrom made his way to an easy goal as he shot the puck into the open net. The Islanders would make it interesting just two minutes later when Michael Grabner made a power move to the net and threw the puck up over Holtby's shoulder. After that, the Caps seemed to clamp down defensively and, aside from a few chances late, held the lead. With Holtby's solid play, the Caps played their best team defense. The Caps blocked 20 shots, including a whopping 7 shots stopped by Mike Green. They also had more take-aways than the Islanders 17-11. Carlson lead the Caps in that category with 4 TKs. The Caps PK was also top notch as they denied the Islanders a power play goal in six chances. Chimera seems to be enjoying his time on the top line. He had a goal with 6 shots on net to his credit. Chimera's speed seems perfect for the talent of Backstrom and Ovechkin which opened some space as both were heavily defended. With Chimera crashing the net, it often opened the wing side to the slot and both Backstrom and Ovi had the space to become dangerous. The Caps were not able to convert on the power play, but they only had two chances with the extra man. New York played a disciplined game only taking two penalties. The Caps however were penalty ridden and spent twelve minutes a man down. If they could have stayed out of the sin bin, the Caps could have gained more momentum and maybe could have pressed harder to the net. But the penalties broke up the offensive rhythm and the Caps spent a lot of time playing catch up. Caps take on Toronto next which is a home coming of sorts for Bruce Boudreau. It will be a tough month for the Caps as they will be on the road 9 of the next 15 games on their schedule. The Caps need to start gaining some momentum offensively to finish the season on a strong note. Caps recall Brian Fahey to beef up the defensive core after injuries to Tyler Sloan and Tom Poti. Holtby was recalled after Michal Neuvirth was injured in the overtime loss to Philadelphia. Both of the Capitals' young goaltenders are nursing ailments to keep them from carrying the load. Semyon Varlamov is well enough to play backup. Former Cap Tomas Fleischmann's season has ended when two blood clots were found, one in his lungs. Flash had found new life in the Avalanche line up and the injury is yet another blow to Colorado who has been riddled with injuries all season. Flash missed Capitals' training camp a few years ago when he developed a blood clot when flying home after the Caps were defeated by the Penguins. You Make The Call - Was it Offside? Was Daniel Sedin's game winning goal offside? It appeared that way to me. Let me state my case through the majesty of photo evidence taken from the Comcast Sportsnet Mid Atlantic's feed. 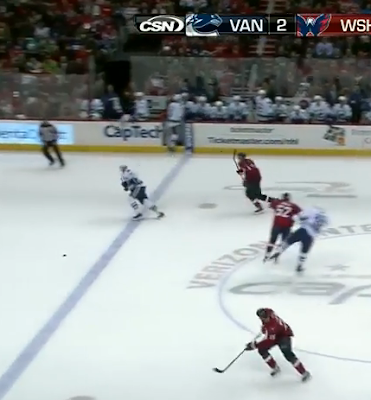 The last shot is Sedin in the clear on a break away scoring what would be the deciding game winning goal. You make the call, was it off side? The Washington Capitals got off to a good start, but some key miscues after taking a rare lead lead to a Vancouver Canuck dominated game as they defeat the Caps 4-2. Matt Hendricks played the game of his career as a Capital scoring the first goal and playing solid all game long finishing with a +1, four shots and 2 hits. Marcus Johansson would pull the Caps close 3-2 with a goal half way through the third period, but that is as close as they would get. Nick Backstrom played an inspired game when faced with his fellow countrymen on the away bench at Verizon Center. He had an early chance when a bouncing puck eluded the Vancouver defender giving the Swedish centerman a free shot at Roberto Luongo. But his deke couldn't beat the net minder's glove. Backstrom would have a brilliant feed to another Swedish Cap, Marcus Johansson who buried a one timer after the Canucks defense broke down. The game did start well for the Caps as Hendricks was set free by Boyd Gordon after a smart breakout by the checking line. Hendricks beat Luongo seven hole and the team seemed to play loose after the lead. Maybe too loose, because it only took 2:25 minutes later when the Canucks answered with a goal of their own. 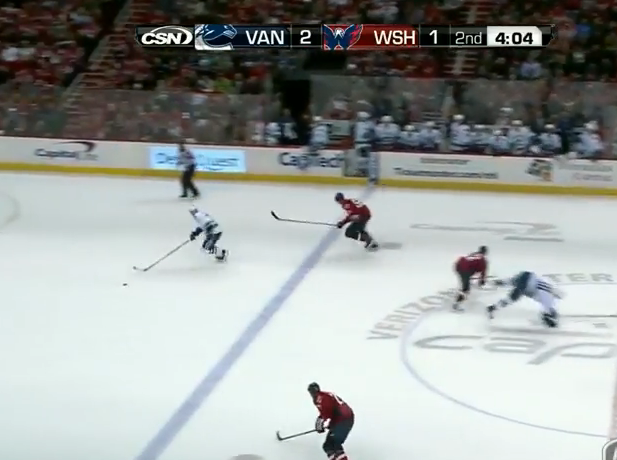 The Caps would let their discipline slip when Jason Chimera took a penalty in the offensive zone by hitting the Canuck defender up high. While the Vancouver player embellished the shot, it was still a penalty and just :44 seconds into the extra man advantage the Canucks take the lead. The Canucks' power play would strike on their first chance and finish the night 1 for 3 on the PP. Then disaster struck in the second period when the Caps seemed to take the momentum. But some cavalier series of passes that would end with Chimera getting poked checked in the neutral zone by Jannik Hansen jumped onto the stick of Daniel Sedin, fresh from the bench. The play actually looked off-side in the least, possibly too many men at the other extreme. Either way, it was some bad luck that gave the Canucks a two goal lead. Again the Caps' power play was disappointing. They squandered all three chances they had the extra man, included a phantom tripping call on Green when he clearly got the puck first on a dive for Ryan Kesler. The power play could not handle the aggressive checking of the Canuck penalty killers and as a result, they could not even get quality chances to the net. The phone booth faithful showed their displeasure at the lack of production, especially on home ice. Caps have a two days to rest up for a mid day special against the Ottawa Senators. A team that seems to play the Caps tough. They have to find a way to get back into the Southeast Division race and get some points on the board. In all fairness, the the Canucks are the best team in the west on a roll. The Caps are still looking for an identity and struggling to get their offense going. Tom Poti and Alex Semin would both be injured scratches for this inter-conference game. Both are listed as day-to-day. Tyler Sloan was sent down earlier in the day to Hershey for a conditioning stint. The Capitals were 5-0-1 against Canadian teams this year. The Canucks will hand them their first loss of the season in regulation. Brian Willsie's short stint with the Capitals was only one game. He was sent back to Hershey as Boyd Gordon returns to the lineup after suffering an infection in his foot. Willsie would score the Bear's second goal to help the Hershey Bears defeat the Adirondack Phantoms 3-0 tonight. Whatever the Capitals learned from their losing streak in December, they soon forgot it in Tampa Bay. In an important game for the Caps to retain the lead in the Southeast Division, they allow the Lightning a 3-0 lead and could not recover. They would give up the two points to Tampa Bay and lose the game 3-0. Dwayne Roloson made the Bolts' general manager Steve Yzerman look like a genius as he continued to plague the Capitals who have yet to score on him in a Lightning uniform. There are just some goaltenders that seem to have a mental edge over the Capitals that it seems hard to score against, Roloson is one of those. He would pitch his second straight shutout of the Capitals and help his team take the lead in the division. The Caps would just have one bad bounce after another. It seemed that Alex Ovechkin couldn't keep a stick intact for any quality shot on net. He would even get a quality chance after jumping from the penalty box, but the puck would stop on him lot letting him break free for an open chance on net. The Capitals just seemed to be on the wrong end of penalty calls, wrong end on bad bounces and if it weren't for bad luck they would have no luck at all. Jeff Schultz, usually a pillar of solid defense for the Capitals, would be a mortal -3 in this game. He often looked a step behind and a gear too slow against the Lightning. Even veteran Tom Poti seemed to look out of sorts on the ice against the speedy Lightning. Mike Green himself just seemed to psych himself out of set ups and just made the wrong decisions with the puck. The Caps' offensive slump continues and does not look like there is any improvement in sight. While the coaching staff has put emphasis on defense, the Caps offense seems to be squandering chances and players are trying to do it all on their own. Frustration was the emotion of the night for any Capital, forward or defenseman. Even when the Caps seemed to gain a little momentum, it would be a bad penalty or a bad play that would negate any chance they worked for. Penalty killers for the Capitals seemed to have returned, if you are looking for a bright spot. They did pitch a shut out with a man down to get back on track. The Caps' power play however continues to struggle. The Bolts played a discipline game, not giving the Caps much to work with with the man advantage. 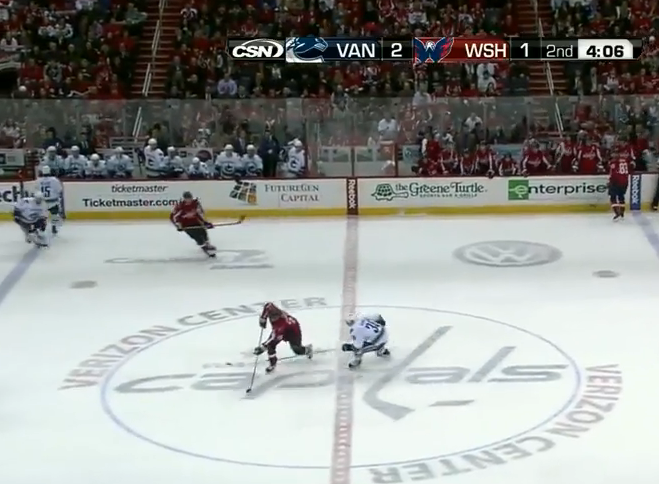 Washington's power play would only touch the ice for 2:22 on two penalties and finish 0-2 on the night. It was a stinker of a game for the Caps. It is much the same struggles they faced in December and it seems old habits die hard. There was zero energy late in the game, making any comeback impossible. The Caps would come away with just a single point on their Florida trip. They return home to face the Vancouver Canucks, a team considered much better than the Lightning. One thing is certain, the Caps can not continue to play this way. For a second time, the Capitals fail to overtake their divisional foes for first place in the Southeast. The Caps would fall to the Lightning almost a week ago to a overtime 0-1 loss, a first in Capitals' franchise history. Alex Semin would miss his second straight game since getting hit in the first game of the home and home with the Florida Panthers. He would not be replaced by Brian Willsie however, Boyd Gordon would make his return. Marcus Johansson continues to struggle in the face off dot, only winning one draw in 8 tries. The best Cap on the ice was Semyon Varlamov who got little or no help from his defensemen. He would stop 35 shots including some dazzlers on the penalty kill. The Capitals would pull a point out of this game, but it would be the wrong way to get a point against a Southeast Division foe. 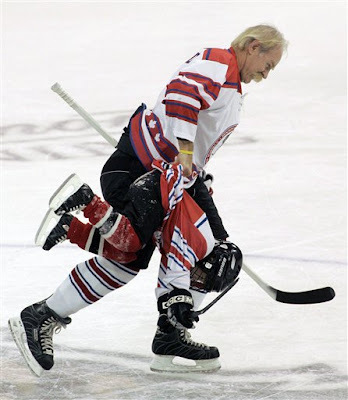 After taking some ill advised penalties and giving the Panthers a pair of 5 on 3 opportunities, the Capitals would not be able to make a comeback. The fall in overtime to the Florida Panthers 4-3. The Capitals, who have been relatively disciplined in their play to this point in the season, took too many penalties against a hard working team in the Panthers who have found sudden confidence against a team that they were unable to even win a game a season ago. It would start with a Mike Knuble penalty for interference and then Nick Backstrom would be called for boarding at the same time kicking off a full two minute 5 on 3 for the Panthers. The penalty killers for the Capitals did their best, but a harder working Panthers team was able to capitalize on their power play opportunity as well as score a goal on the momentum gained by the power play to put the Caps in a two goal hole early. Florida would be 3 for six on their power play (that had been struggling up to that point) including two goals on two chances 5 on 3 and the game winner in overtime was a power play tally. 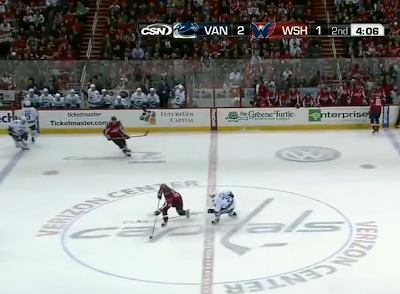 In contrast, Washington's power play continues to struggle going 0 for five with the extra man advantage. That was including a golden opportunity with the game tied for them to get the go ahead goal. But they floundered the chance, often turning the puck over before they could even enter the zone. Bruce Boudreau would even move Alex Ovechkin around on the PP to try to gain some kind of spark for the forward and the extra man advantage to convert just once. Ovechkin would start in his usual position on the point with Mike Green his partner. But in the third, Boudreau would move him up to wing letting John Carlson see some time on the power play opposite of Green and Brooks Laich would be the odd forward out from the first power play unit. Not all of this game was bad news for the Caps. They did mount an impressive comeback down 3-0. Marcus Johansson was a big part of that rally as he scored on a pretty give and go with Laich to cut the lead to just two goals. His shot would beat Tomas Vokoun five hole and trickle into the net. Mike Knuble would get the Caps a goal closer when buried a pretty feed from Ovechkin up over the glove of Vokoun. Again it would be Johansson giving life to a near dead Capital offense, tying the goal up at 3 after Matt Hendricks threw the puck on net. MJ90 would trickle one in through Vokoun. Johansson nearly had the hat trick when he deflected a picture perfect pass in front, but Vokoun's glove was in the right spot at the right time to make the save, denying the rookie his first career hat trick. Michal Neuvirth played a as solid of a game as he could with the amount of penalties his team took in this game. he came up huge in the second and third periods to allow the Caps to comeback. He had good rebound control and relied on his quick reflexes to shut down the hard working Panthers sending pucks to the net. He also got some help in the blocked shot category as the Caps helped their rookie goaltender out stepping in front of 19 shots. But in the end it would not be enough. Green would take a hooking call after the Panthers had sustained pressure in the overtime period. The Caps would fail to even get a shot on net in the extra period. In fact the Caps have not had a shot on net in the last 2 overtimes they have played. They do take home a standing point that pulls them dead even with tomorrow night's opponents. The Caps have to have a better self control as they visit the Tampa Bay Lightning tomorrow night. It is their chance to take over the lead to the Southeast Division. A title they have struggle to maintain this season as Tampa and Atlanta pressure for that top spot. Brian Willsie's return is due to Alex Semin's hip injury. Semin is listed day-to-day. Willsie played well getting on the score sheet with an assist and would draw a penalty with his veteran savy. The last time the Capitals came back from a 3-0 deficit was last season in the NBC game of the week featuring the Caps versus the Chicago Blackhawks. Nick Backstrom scored the game winner in overtime to complete the comeback win. There would be no such ending tonight however. The Capitals have won 12 games when they give up the first goal (12-11-3). That is three more wins than any other team in the league. Alex Ovechkin and Mike Green were chosen for NHL's All Star Game. Snubbed were Alex Semin (might not be a bad thing considering his injury) and struggling Nick Bacstrom. John Carlson was snubbed as well for the rookies. It would be another slow start for the Washington Capitals allowing the first goal against. Then Bruce Boudreau threw out the line changes and the Caps stop the bleeding enough for them to find their offense. Besides a late goal by the Florida Panthers, the Caps stop enough to take home two much needed standings points by a score of 3-2. Eric Fehr started the scoring in the second period as the Caps tie up the game at one off of some pretty passing by Mike Green and Mathieu Perreault. Green would find his scoring touch to put the Caps into the lead. Alex Ovechkin scared off some non-scoring demons with a classic Ovi goal that would put the Caps up by two and eventually be the game winner in the third. Again, the Caps found themselves giving up the first goal after a breakdown in the zone and some smart passing by the Panthers. But the Caps would button up the defense and Semyon Varlamov would stand tall in net. He would make 25 saves on the night including turning away nine important shots in the second period. There were a few times the Panthers had the Caps down and out. With a little luck and Varly standing on his head at times, the Caps practiced bending but not breaking to perfection. The Capitals just had to hold the line and allow their offense time to break out of their funk. Eric Fehr would be the benefactor of a Mike Green rush behind the net. Green threw the puck out front after cruising behind the net and found Fehr's stick. Fehr didn't have to put it top shelf on the awning net, but did anyway to tie the game at one in the second period. In the third it looked as if both teams would stem each others offensive advances. But a tripping call on Michael Frolik mid way through the period would set up the Caps on the power play and it would finally pay off. After all the struggles on the power play, it would be Eric Fehr to shake a goal loose for the Caps as he carried the puck through the middle and found Green cutting in off the boards. He passed it to the defenseman that made a smart deke around the Panther defender before burying the puck past Steve Clemmensen for the Caps first power play goal since the Winter Classic. Ovechkin would break his scoring slump after a misplay by the Panther defense. Once Florida got the puck deep, the Panther defenders were pinching in to keep the play inside the Caps zone. The game plan was working well for them until Nick Backstrom (another Cap struggling to find points) chipped the puck up to the wing to Mike Knuble. The Panther defense decided to pinch down on Knuble leaving Ovechkin open on the far wing. Knuble would chuck it to the open Ovi who was breaking down the left side. In a classic move Ovechkin would pull the puck in then out to get the shot out. He had to snap it quickly as the Panther defense closed in on him just 15 feet out from the Panther net. The quick snapper beat Clemmensen low glove side to put the Caps up 3-1. It looked as if the Caps had the game at hand. But the Panthers did not exactly give up. The very next shift, Florida pressured in front of the net nearly putting it in as the Caps defense let up. They would score after Varlamov would leave a juicy rebound in front and the Panthers jumped on the loose puck for the goal. It would make things interesting down the stretch. But what made it down right scary for the Caps is when Backstrom was called for a cross check with just 1:05 left in the game. The Capitals penalty killers would do their job and secure the win. The PK was a huge bright spot for the Capitals as their power play has struggled. Tonight they were a perfect four kills for four shorthanded opportunities. The Panthers failure to convert on any of their power plays kept the Caps in the hunt for most of the game until Green's power play goal broke open the scoring in the third period. The Caps will need to continue to plot the course when they face the exact same Panthers Tuesday night in Miami. The Caps need to keep the pressure on in the Southeast Division as they are fighting to take the lead. The Tampa Bay Lightning still have the lead in the division, just a point ahead of the Caps. Alex Semin was injured from a awkward hip check in the second period. He would not return for the remainder of the game. Speculation swirled around Semin re-injuring his back. This Alex Ovechkin's fifth game winning goal of the season. It is one goal more than he had last year at this time. Boyd Gordon is closer to rejoining the team after his staph infection in his foot. Boudreau expects to have the face off expert back in the line up in about a week. Steve Yzerman knew what he was doing when he brought some goaltending muscle in Dwayne Roloson in a trade with the New York Islanders. The Tampa Bay Lightning play the perfect road game against the flat Washington Capitals who were coming off of an emotional Winter Classic win. When the Caps finally got their legs moving, it would be too little, too late as Roloson shut the door and Martin St. Louis puts the finishing touches in overtime as the Lightning take sole possession of first place in the Southeast Division with a score of 1-0. Semyon Varlamov played as perfect a game as one could with a team that just didn't have much of a jump. He would turn away all of the Lightning 33 shots in regulation. He would face another 5 shots in overtime, but the fifth one got by him after poor coverage in front and an errant rebound landed right on St. Louis' stick. Varly earned the Caps single point tonight. The Capitals had such a sluggish start that it was hard to believe this was the same team that seemed to out hustle the Pittsburgh Penguins New Year's Day. They only managed 5 shots in the first period. They would pick up the pace in the second period by getting 21 shots to the net, but Roloson was stellar in net. In overtime, the Capitals didn't even get a shot on net. Again the Capitals' power play failed to convert on three chances, including a golden opportunity in the third period. The Lightning's aggressive penalty kill was partly to blame for the Caps' troubles with the extra man, but the Caps failure to convert even just a single power play goal in tight games is hurting this team. Caps better find a way to score on the power play and play tougher against their own division as their next three games are against division foes. Twice against the Panthers in a home and home before they play the Lightning at St. Pete Times Forum in Tampa. Caps will have to make up some ground on the Lightning who take over first in the division by a point. The Washington Capitals learned their lesson; simplicity is the best weapon in the face of adversity. The Caps utilized that in the NHL's Winter Classic to win against their bitter rivals, the Pittsburgh Penguins. December started as a tough month for the Caps. They had suffered through a eight game losing streak. It was two weeks with out a win and earning only two standings points during that stretch and they would come into NHL's Winter Classic as a team just turning things around. They were unbeaten in regulation in 5 games with a shoot-out loss against the Penguins looming above them coming into Heinz Field on New Year's Day. When the weather turned on the league's premiere outdoor event the Capitals did not use poor ice as an excuse nor did they try to force the game to suit their high skill style. Instead they went back to basics. "We thought it was going to be just a grind it out game," Bruce Boudreau said about his thoughts before the game concerning the situation. "After we were on the ice yesterday, it didn't look like the ice conditions would be great. We knew the fancy tic-tac-toe stuff wasn't going to work. So we knew we had to dump it in and we had to win the game below the circles. I thought we did a real good job of that." The Caps first goal to tie the game at one was anything but fancy or tic-tac-toe. On the power play, the Caps crashed the net creating confusion in front of the Pittsburgh net. Mike Knuble would jab the puck into the net. Their first goal would be the definition of a garbage goal. With ice conditions as tough as they were, the Caps could not play their high risk/high reward skill game in the neutral zone. So, they kept it simple. They dumped the puck in deep and let their forechecking game take over. It would lead to several Penguin turn overs including Marc-Andre Fleury's flub behind the net that allowed Marcus Johansson find Eric Fehr in front of a wide open net. "When you play with a lead on ice like that, it's the simple things that are going to win you games," David Steckel said of their strategy. "So we got it out and got it in and tried to play well defensively. It was a great effort tonight." As the Penguins pressed, the Caps relied on simple outs to keep the puck moving out of their zone. When the situation presented itself in the third period, it would be a simple give and go that would open up the Pens' defense and Fehr would score his second goal of the night to add some insurance. "We had a good lead going into the third," Fehr said of his second goal. "We just wanted to play defense and fortunately I was able to get that second one. We weren't trying to go for offense right then." For a team that has blushed away from sandpaper-like play when the going got tough, the Caps used it effectively on the road in front of 68,111 fans. It wasn't perfect, but when the defense faltered Semyon Varlamov came up with the save they needed. "It was pretty tough to keep concentrated with the water [on the ice]," Varlamov said of his trials with the ice. Getting the lead was important for the Capitals. It was hard to even make simple out passes out of the zone. But protecting the lead through a period and half of the game, it took everyone to keep their play simple. "Our skill guys like Ovi and Semin, they were dumping the puck in and getting deep rather than try to tangle and it worked out," Caps' tough guy John Erskine said. "We got it deep and went after them and kept the lead." Since making passes was a near impossibility, the Penguins tried to play catch up on terrible ice. They were flubbing the puck in the neutral zone as the Caps stood tall on their blue line to keep the them from even entering the zone. The Penguins tried to rely on their skill to get back into the game, but the conditions would not let them. "Certainly tonight, given the situation, they were content to get pucks out and get them deep," Penguins' head coach Dan Bylsma said after the game. "It made it tough on us to try and mount something to get some offense in the third period. It made it difficult on us." It is a hard lesson to learn, but a long losing streak sometimes prepares a team for adversity that is not apart the norm, like, for instance, the Winter Classic. The Caps seemed to have learned their lesson and players have risen to the occasion. Now it is time to work that experience into the post season. In some division news, the Tampa Bay Lightning make a trade to pull in better goaltending. The Bolts trade for Dwayne Roloson from the New York Islanders. The trade bolsters the Bolts' goaltending core and may make things interesting for the Capitals. In 13 games played, Roloson is 6-4-3 against the Capitals with a 2.40 goals against average and a save percentage of .909. A much better record than Dan Ellis and injured Mike Smith. Neither Bolt goaltender have a win against the Caps. As Tampa is looking to de-throne the three-time Southeast Division Champs, they needed to get solid goaltending. Why not get a goaltender the Caps have had a hard time with in Roloson. Although the Caps did open up with 4 goals in 12 shots the last time they faced him, chasing him from the net after the first period. The Caps may get their next chance to face Roloson on Tuesday night as the Lightning visit the Caps at the Verizon Center. The Caps next four games are against division foes in the Lightning and the Panthers. Even with a light drizzle falling down and poor ice conditions, the Washington Capitals proved they could deal with a different kind of adversity. In what had to be the most hyped game with an HBO documentary crew following both teams, the league and networks revving up the rhetoric of the rivalry of the teams and both captains Alex Ovechkin and Sidney Crosby, the Capitals play the perfect road game defeating the Pittsburgh Penguins 3-1. Eric Fehr scored a pair of goals after coming into this game with only 5 goals to his credit. Mike Knuble would get a great garbage goal to tie up the game in the second period. The weather kept the skilled players from playing their style of play. The game turned out to be a grinders paradise and Jay Beagle, a hard working grinder for the Caps, had the first two chances by getting his nose in front of the Pens net. It would be a muckers goal by Mike Knuble to get the Caps on the board after giving up the lead on a Evgeni Malkin break away goal. Nick Backstrom just kept the puck in front after a point shot, with the traffic in front of Marc-Andre Fleury. Knuble found the banged in the loose puck past the Penguin goaltender. The goal energized the Capitals forechecking and they kept the pressure on. When Fleury mishandled the puck, speedy forward Marcus Johansson was able to pick up the loose puck behind the net and find Fehr in front with a wide open net. Fehr would add a second goal and some insurance in the third after John Erskine made a solid break out pass to Jason Chimera. Chim played a give and go with Fehr and it broke the winger open. Fehr would beat Fleury high glove side to give the Caps a two goal lead. The Penguins would make a last ditch effort to try and tie it up, but the Caps stood tall on defense. At one point they stood at the blue line prompting play by play man Doc Emrick called them the white picket fence. It would lead to some rough play with just .6 seconds left as the rivalry went to another level as both teams gave a few face washes and end up leaving the ice with out shaking hands. The title bout was in the first period. John Erskine took on Michael Rupp in a heavyweight bout that saw both players landing some haymakers. Erskine did stumble after Rupp connected, but he got right back up and landed a few of his own before Rupp had to call it quits due to a contact lens problem. With all the hype on both Ovechkin and Crosby, neither found their way onto the scoring sheet. Ovechkin did have a goal that was waved off after he made contact before that with Fleury. But both players were kept in check for the most part of the game. Crosby was hit as the second period ended by David Steckel. Sid was caught not paying attention to where he was going and when the play shifted, he was looking behind and Steckel was charging up the ice. The Pens' coaching staff called it incidental contact. The best Capitals player had to be Semyon Varlamov. Faced with a bouncing puck and some serious rubber from the Penguins stood tall in net. He played his rebounds as best as he could considering the conditions. Shots from the outside he was able to see, a credit to the defensive core in front for boxing out crashing Penguins. Varly would turn away 32 shots as his teammates helped by blocking 16 shots. While Fleury went a wandering from his net from time to time, Varly stayed in his net and didn't turn over the puck that lead to any scoring chances for the Penguins. In the end, it's just two points. It is a huge confidence boost for the Capitals as they shake free from a bad stretch of games to get their third straight win. They now are unbeaten in regulation in their last six games. They also creep up the Eastern Conference ladder as they are just one game behind the leading Penguins but remain behind Tampa in the division in a tie (Caps have played 2 more games than the Bolts which is the tiebreaker to this point).